It’s hard to believe that I’ve only been here for a little more than a week. I’m already overwhelmed by how many people I’ve met and how many incredible places I’ve gone! The shock of living in a different country is definitely beginning to set in. I can sum up the better part of this past week by saying I’ve been lost. A lot. Actually, each and every time I’ve left the JFRC (also colloquially known as “J-Force”) I’ve ended up lost at some point during the excursion. But really, it’s not so bad to be lost in Rome. 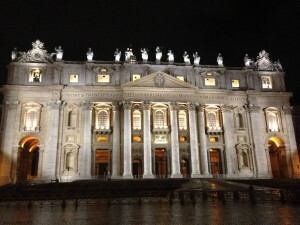 One night, my friends and I ventured out to see the Vatican and the nativity scene all lit up at night. I’d never seen it before, and it made me do some weirdly deep thinking (bear with me). Watching all the birds circling around St. Peter’s Basilica, I thought about how they’re so lucky that they can fly wherever they want to go and perch on top of these magnificent buildings. And they don’t even know how important the building is that they’re sitting on. They don’t know even how much of a miracle it is that they can soar through the air. But then it dawned on me that I’m kind of bird-brained in that sense, too. I can fly wherever I want to (hypothetically), and most of the time I get too caught up in everyday life to realize how lucky I am. 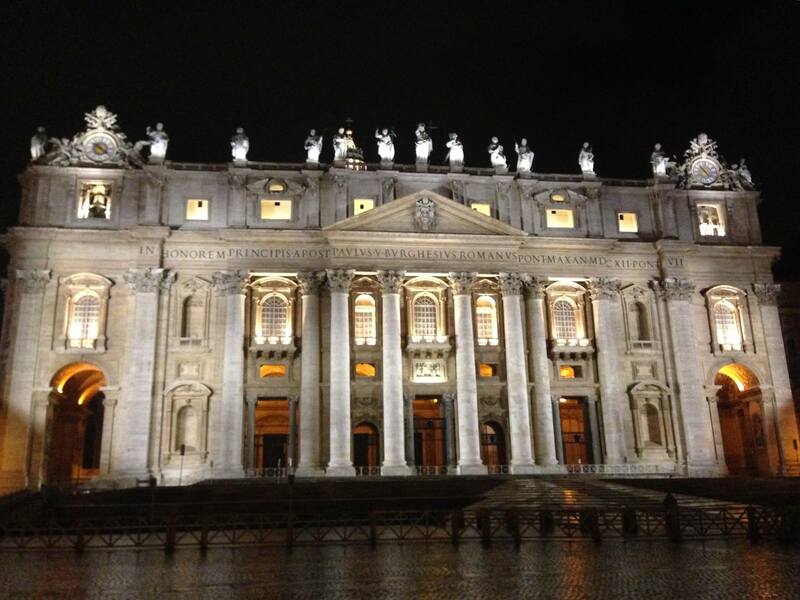 I somehow ended up in Vatican City, standing in front of St. Peter’s Basilica, a place that most people on this earth only dream of seeing in their lifetime. It occurred to me that in every sense of the word, it’s a miracle that I not only get to go to college, but that I get to do it in a completely different country and learn about a vastly different culture. It put into perspective all the stress of planning weekend trips, and the anxiety I’ve felt about being away from home. I’m sure this is only one of the profound — and profoundly cheesy — moments I’ll have during my time abroad. After spending some time around the Vatican, we wandered down the street into this adorable little place called Bukowski’s. We split a bottle of wine amongst us and played a fun, wholesome game of Italian Scrabble. After a lot of laughing and, on my part, attempts at bending the rules, we set out to find the 24-hour “Secret Bakery” we’d been hearing so much about from other students. I’ve never seen more pastries in one place, or a bigger variety of them! It was like descending into Wonderland. The weekend was full of adventure that deserves a separate post, but I’ll try my best to condense it into this one. 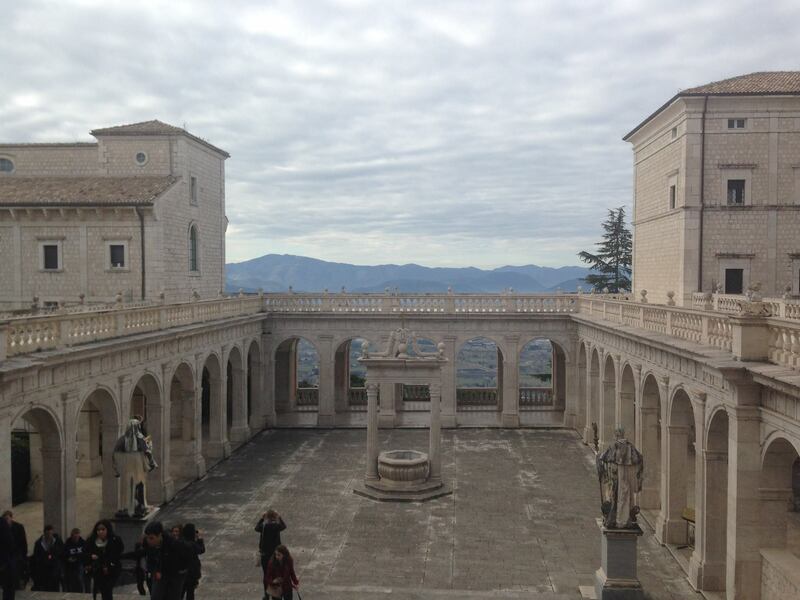 We took our final orientation trip, and stayed at Lloyd’s Baia hotel in Vietri sul Mare. The place was absolutely gorgeous — a hotel right on the edge of a cliff, overlooking the water — located at the starting point of the Amalfi Coast. I watched the sunrise over the water/mountains Saturday morning from my bedroom’s balcony. It was hard to tell whether or not I was still dreaming because it was both insanely gorgeous and ridiculously early in the morning. Though incessant rain and an unintelligible tour guide made Friday feel long and dismal, it was great seeing the temples and ruins of Paestum. Saturday was by far my favorite day of the orientation trip. 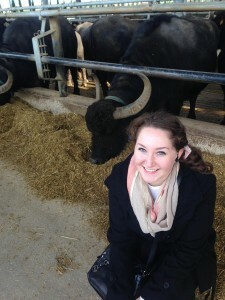 We took a tour of a buffalo mozzarella farm and got to do a wine tasting/tour at Vini Marino wine farm. This is the stuff that dreams are made of, people. The buffalo were adorable in their own nasty way, but you could tell that they were enjoying their lush lifestyle at the farm. They get daily massages, their own beds, and simply saunter in to be milked when they felt the time was right. Oh, and the farmers play classical music for the buffalo some mornings to free them of stress. 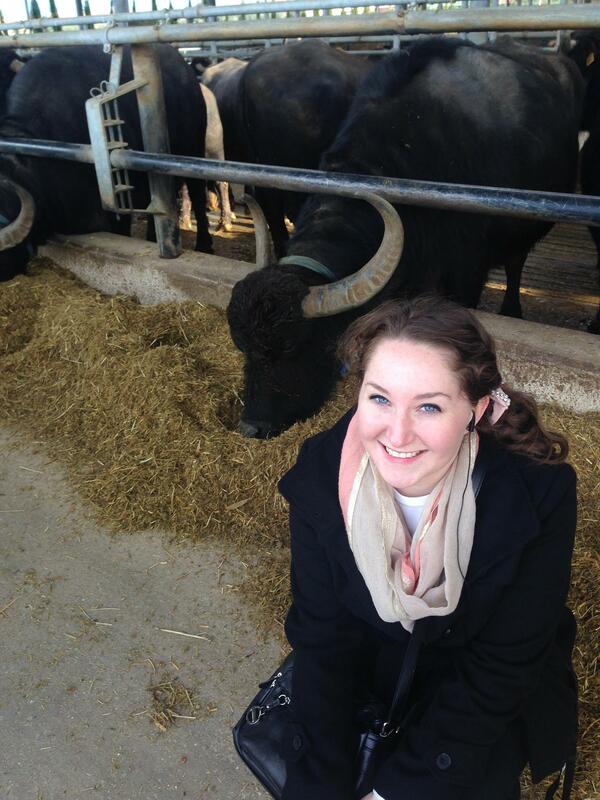 I never thought I’d be jealous of a buffalo, but, well…here I am. We sampled some of the cheese (which is very fresh, with an odd aftertaste, and would be delicious with tomato and basil), and had fantastic gelato that was made with buffalo milk. At the wine farm, we were walked through the process of wine-making and learned how it differs for red wines and white wines. The vineyard was as picturesque as you’d imagine, tucked away in a corner of the hillside. I’m not a wine connoisseur, but I can assure you that the wine was smooth and flavorful (are those appropriate adjectives to use for describing wine?) and I enjoyed it immensely. Later in the day, we went to the beautiful town of Agropoli and I attended mass at the Santa Maria delle Grazie Church. 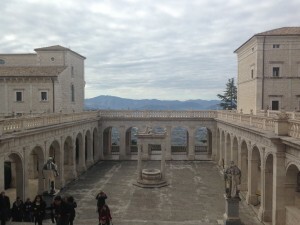 Sunday, we packed up our things to head back to the JFRC and took a tour of the Abbey of Montecassino on the way. The Abbey is a monestary located right at the top of the hill (more like a mountain, from my Ohioan perspective) that has been destroyed and rebuilt several times since it was first established in the 11th century. Not only was the place huge with an amazing view, but the history was fascinating. If you ever have a chance to go there, it’s well worth the terrifying twenty-minute drive to the top of the hill, even if you’re afraid of heights like I am! Well, I won’t bore you all by going into detail about the several four-course meals I ate over the weekend…or by describing how when 250 college students are thrown together to stay in a hotel on the bay for two nights, those nights are going to be quite memorable. All in all, suffice it to say I had a wonderful and totally exhausting weekend.